I found the recipe in a fun book for kids called, Camp Out by Lynn Brunelle. The author suggests making the bread and roasting it on a stick. 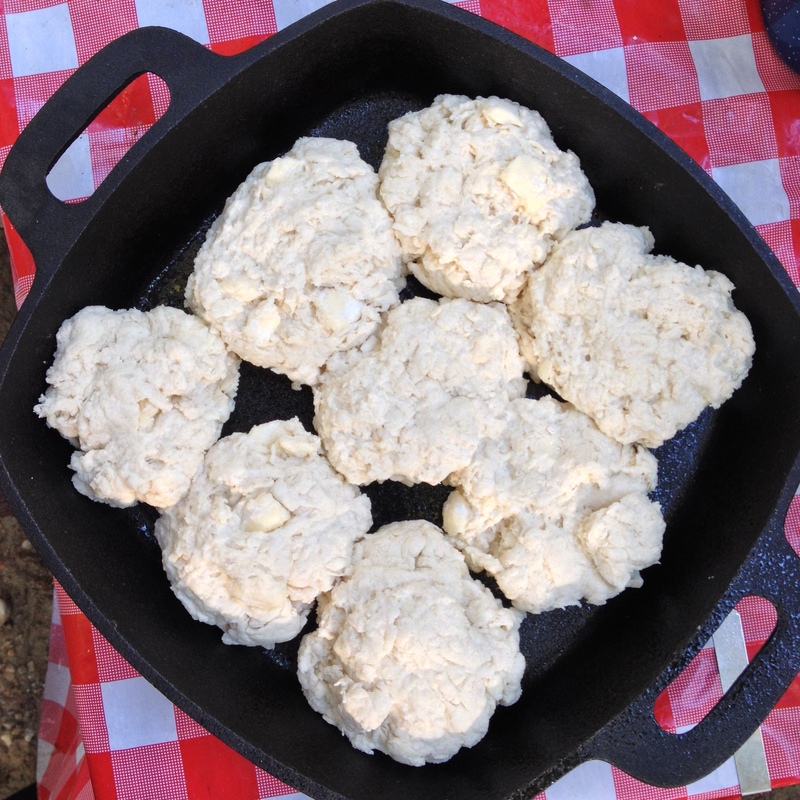 I turned it into biscuits cooked in a 9″ cast iron pan. You pre-mix the dry ingredients with the butter so the only prep you do on-site is adding water and mixing. Perfect! 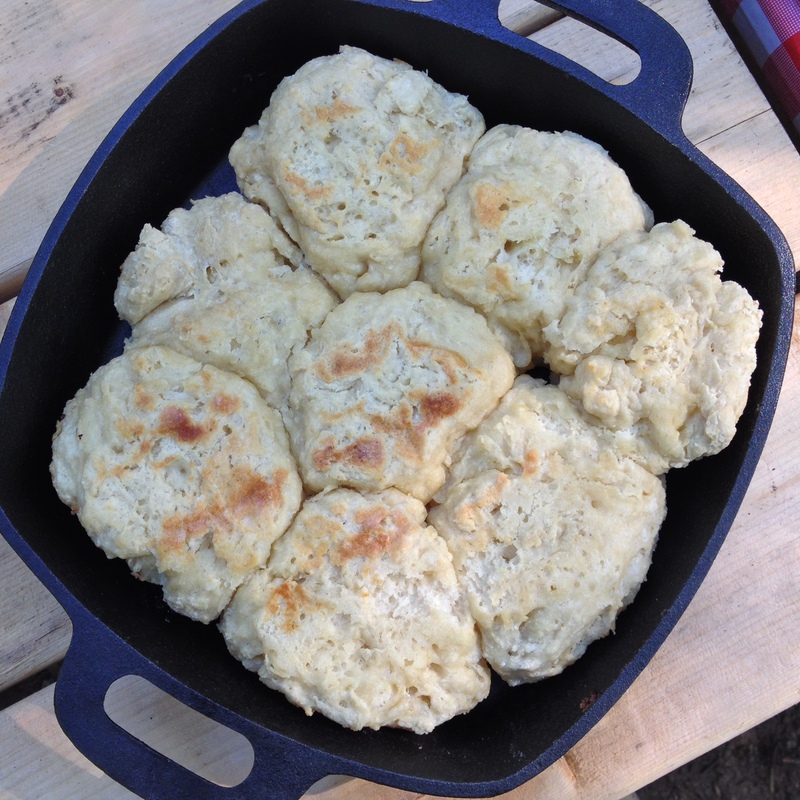 The number one ingredient in my Campfire Biscuits is Patience. Cooking over a fire is a lot of fun but does require extra time and patience. 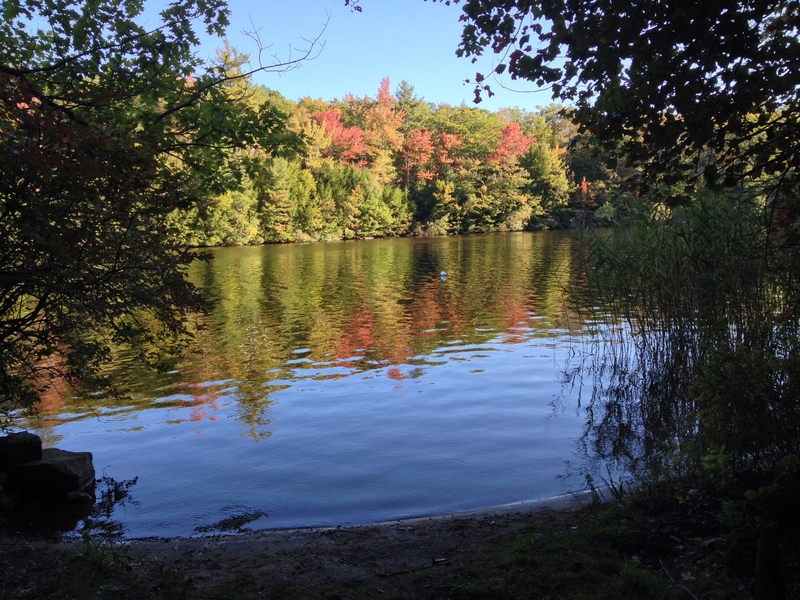 Which, I guess, is another reason I like camping and cooking at our campsite so much. I don’t have a list of things to accomplish, only the meal to watch over and the freedom to take the extra time required. I find it relaxing. I hope you give it a try over your own campfire or firepit, or even your grill. I haven’t tried these biscuits in my oven. Let me know how it goes if you cook them that way. Can’t guarantee the cooking time in the oven or over the campfire as that will be dependent on how hot your fire is. So stick close by and give yourself the freedom to relax while cooking. 1.Place the flour, baking powder, sugar and salt in a zip-top bag. Cut the butter into pieces and add to the bag. Seal the bag and massage it until you have crumbled the butter into pea-sized pieces. Store in the refrigerator or cooler until ready to use. 2. Pour mixture into a bowl. Add the water and mix briefly until combined. 3. 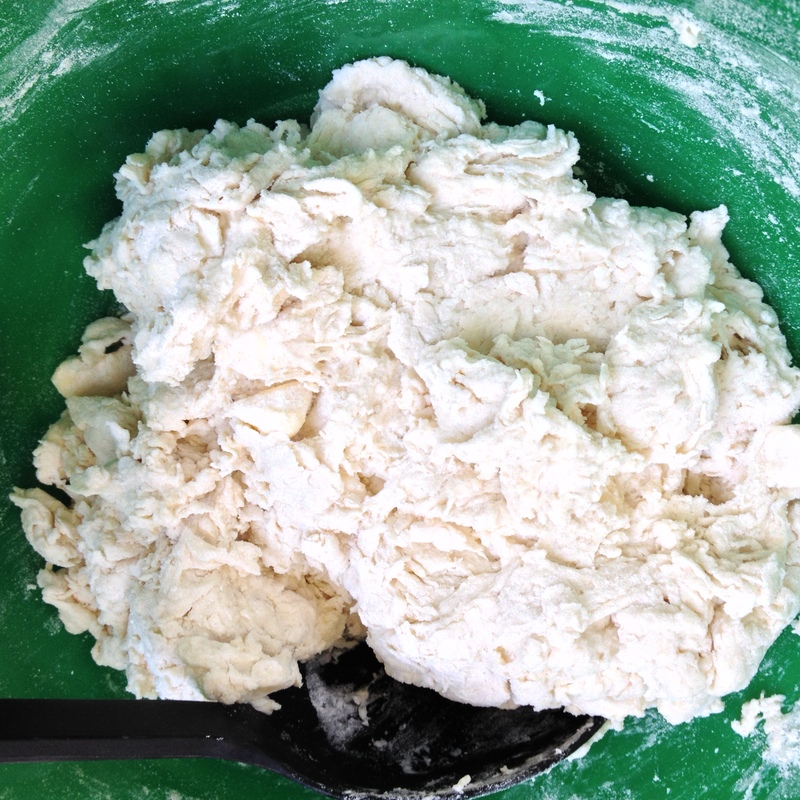 With floured hands, scoop up a handful of dough and shape into a round biscuit. Place in a 9″ greased cast-iron (or heavy-bottomed stainless steel) skillet. Continue until all dough is shaped into biscuits. 4. 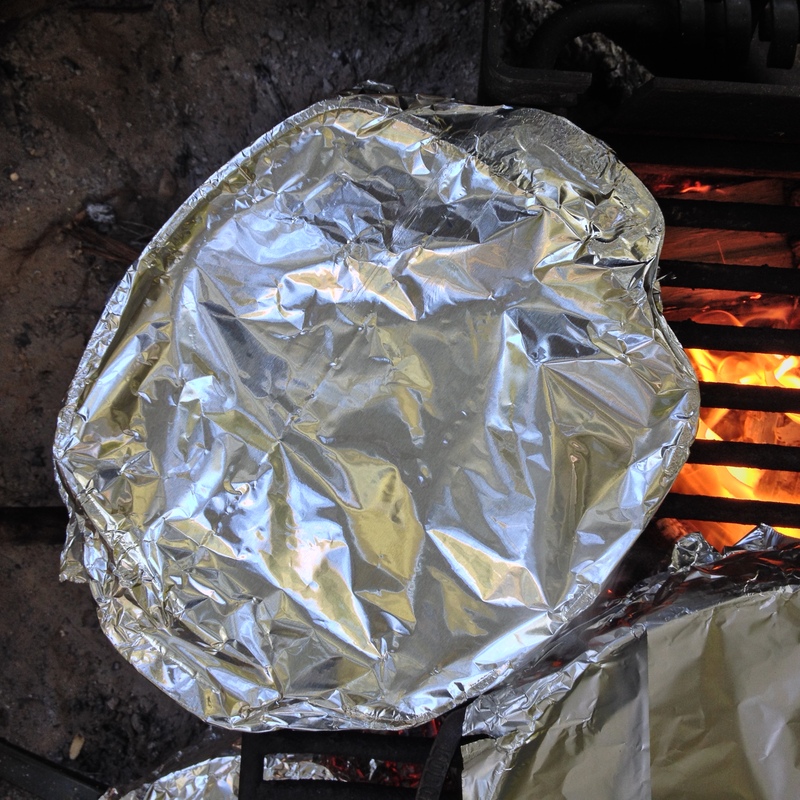 Cover skillet with greased aluminum foil and place over hot embers (move rack close to embers). Cook, rotating skillet to assure even heating, for about 20 minutes. 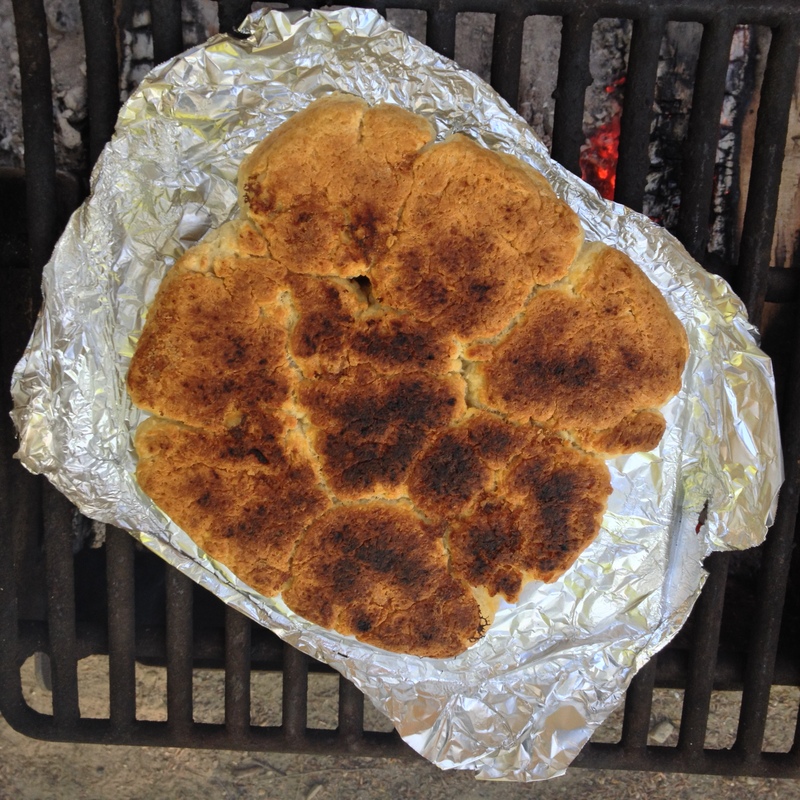 Then flip biscuits onto the foil and place on grill rack again. Cook for about another 5 minutes to lightly brown top of biscuits. 5. Serve warm and enjoy with or without more butter. Sadly, it is time to say goodbye to summer and all the sweet berries that I enjoy those warm months. I comfort myself with the thought of apple season, hot soup, and cool nights… especially when we are having our warmest summer weather now that is is September. But I digress. 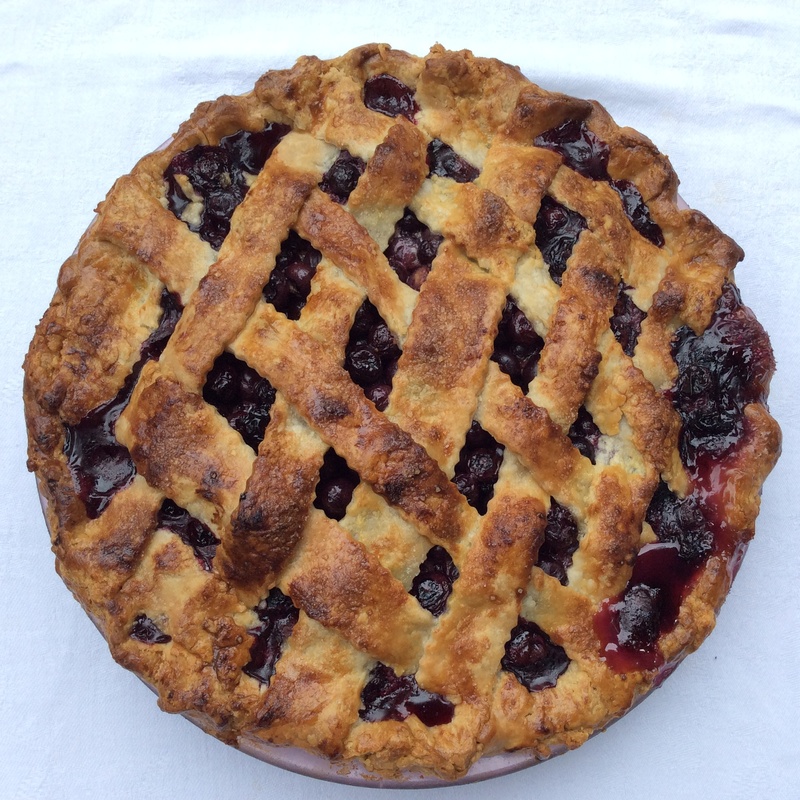 I wanted to close out the season with a pie that epitomizes summer: a Lattice-top Blueberry Pie. Go grab some berries and get to work before they are all gone. The filling is easy. Toss berries together with lemon juice and then sugar, cornstarch, cinnamon and salt. Put in crust and dot with butter. 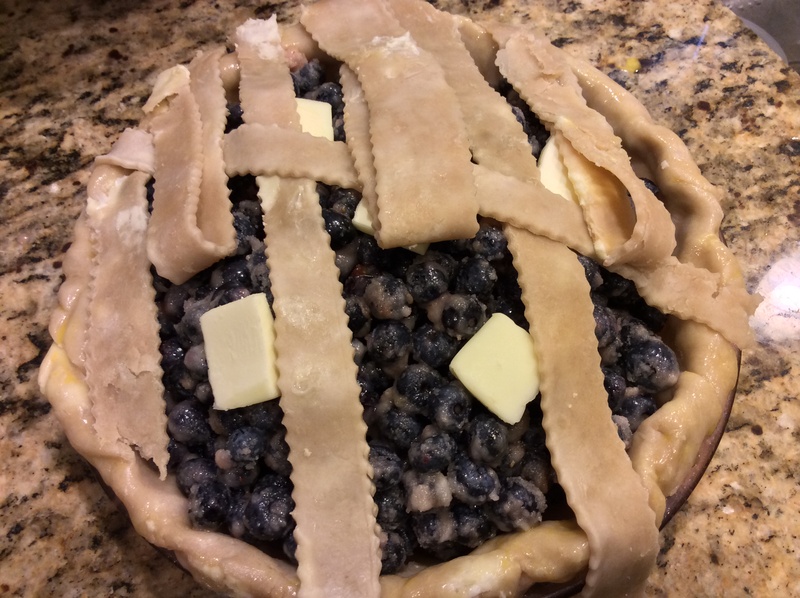 For the lattice crust, I made mine directly on top of the pie. But I recommend making your lattice crust on a piece of parchment paper on a sheet pan until you get the hang of it. If the dough softens too much you can pop it in the fridge to chill before continuing. And don’t worry too much if your lattice isn’t perfect. It’ll still look beautiful. When finished, chill again while you make the pie. 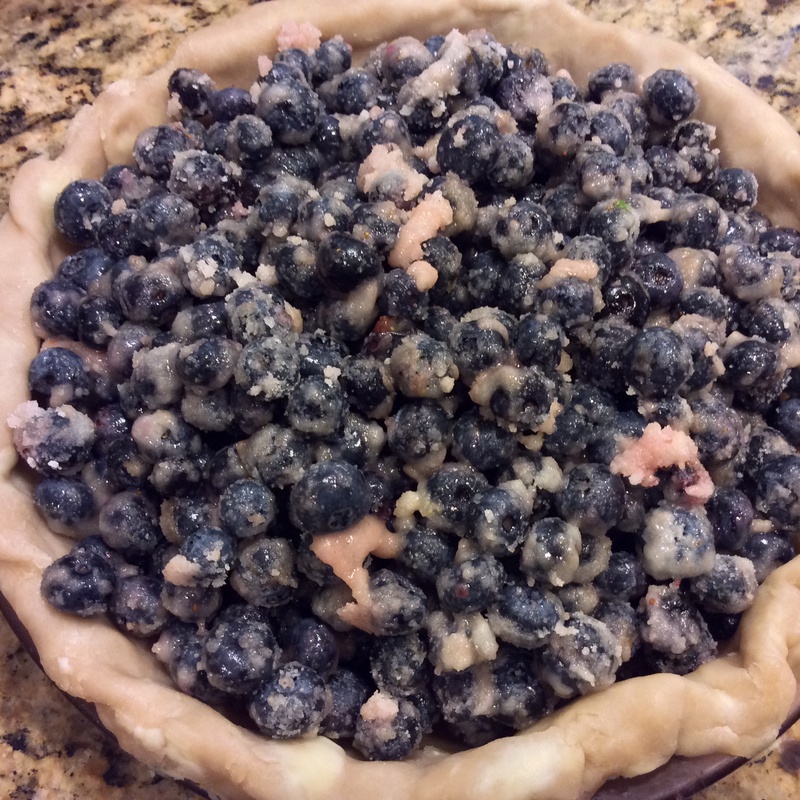 Then invert the whole crust onto the pie. Of course, if this seems like too much work, you can put a whole pie crust on top of your pie. Just be sure to cut some air vents in the crust or use a small round cookie cutter to cut out small holes in a decorative pattern. Either way, it’ll be delicious and gone before you know it. 1.To prepare crusts: On a lightly floured surface, roll one pie dough disk with a floured rolling pin into a circle about 1/8-inch thick. Fold in half and half again and carefully lift into a 9-inch pie plate. Unfold and chill for at least 30 minutes. Take second disk of dough and on a lightly floured piece of parchment paper, roll dough into a rectangle about 1/8-inch thick. 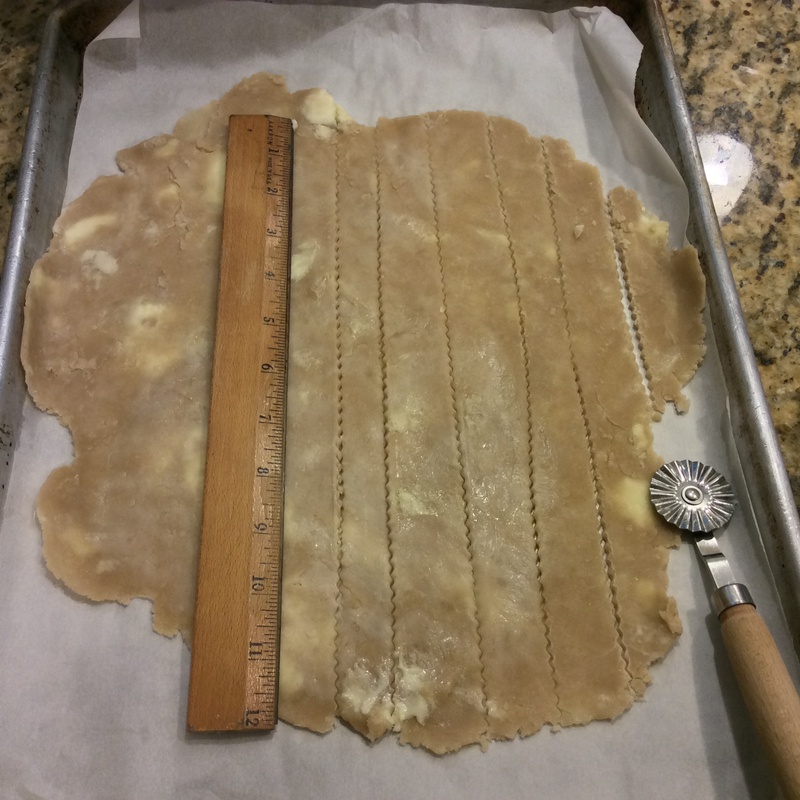 Using a fluted pastry wheel or knife and a ruler to guide you, cut dough into 12 strips about 3/4-inch wide. On a lightly floured piece of parchment paper, lay 6 strips about 3/4 inch apart. Fold back every other strip more than halfway. In the center place another strip perpendicular to the strips on the bottom. Unfold the strips and fold back the other 3 strips. Lay a second top strip down and unfold the bottom strips. Repeat this process on both side of the crust with the remaining top strips. Gently press down where the strips overlap to help seal the dough in place. Cover with plastic wrap and chill while making the filling. 2. Place a sheet pan in the oven on a rack and preheat to 400°F. In a large bowl, toss blueberries with lemon juice. 3. In a medium bowl, whisk together sugar, cornstarch, cinnamon and salt. Add to blueberries and toss well. 4. 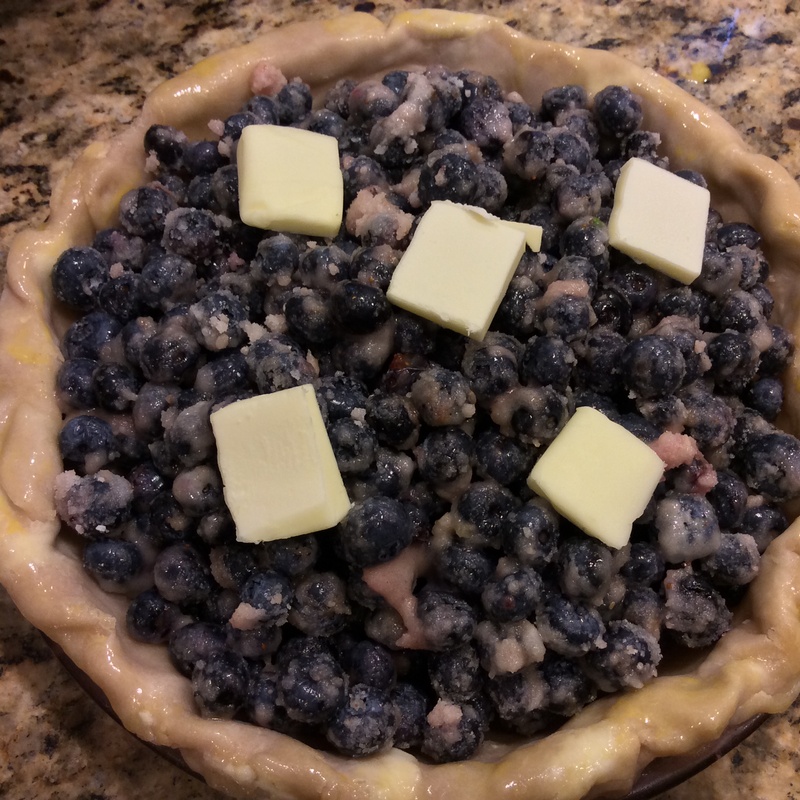 Scrape the blueberry filling into your pie plate. Dot with butter pieces. Remove your lattice and let sit a few minutes until malleable. 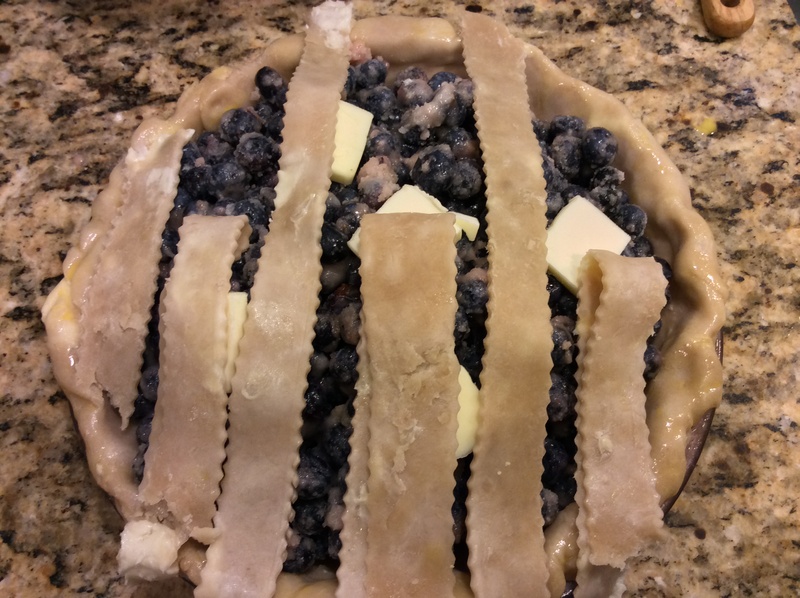 With the parchment still attached, invert the lattice crust onto the pie. Carefully peel parchment off of crust. Roll the overhanging dough under the bottom crust edge and press to seal. Crimp edges. 5. Make an egg wash by beating 1 egg with about 1 Tbsp of water. Brush over crust. Sprinkle sugar over crust. Put the pie in the oven on the preheated sheet pan. Bake for 20 minutes, then reduce oven temperature to 350°F. Bake about 30 minutes more, or until lattice is browned and filling is bubbling. If lattice is browning before pie is finished baking, cover it loosely with foil. 6. Let cool on a rack to room temperature before serving. This is more of a revelation than a full-blown recipe post. A revelation, as in why have I never made this before? 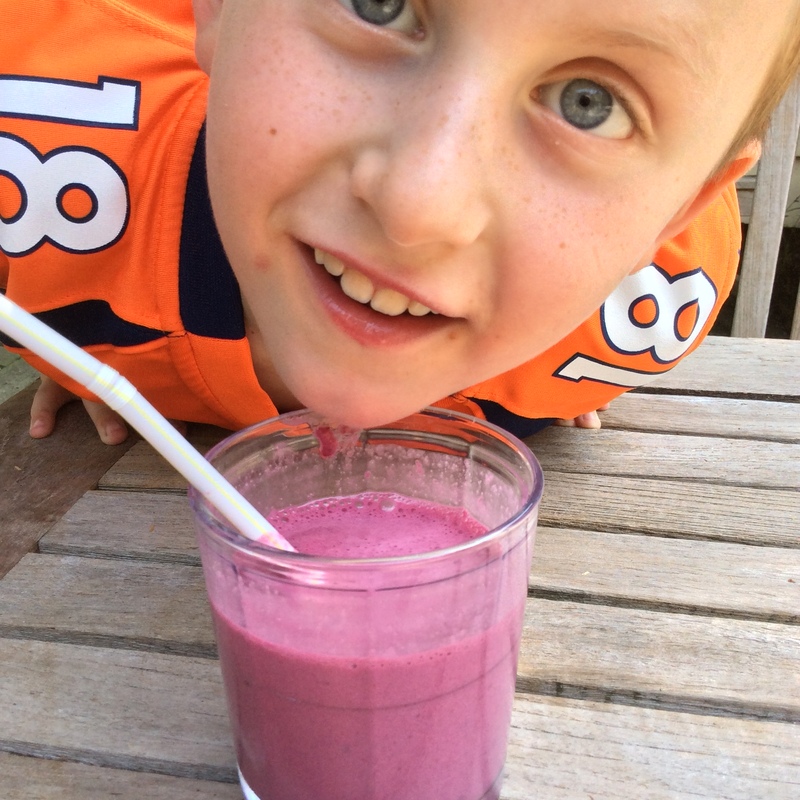 A cherry milkshake— my new favorite milkshake, ever. 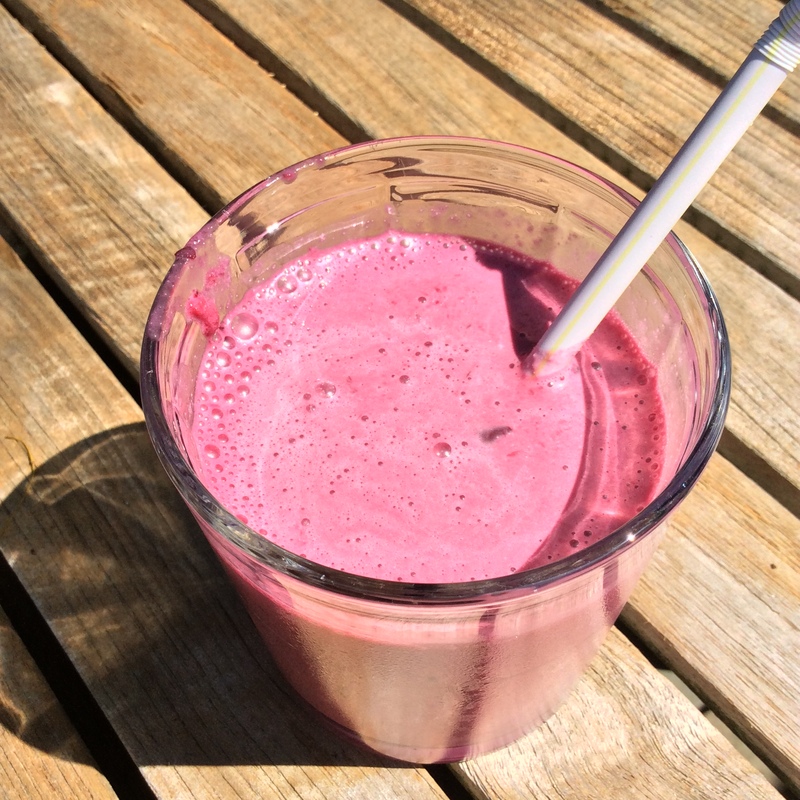 I read a post on the site Orangette about a sour cherry milkshake and couldn’t “shake” (excuse the pun) the idea. A few hot days later, I had Bing cherries in the fridge and vanilla ice cream in the freezer. Voila! A decadent and delicious afternoon treat for my kids and I. 1. Pit the cherries. 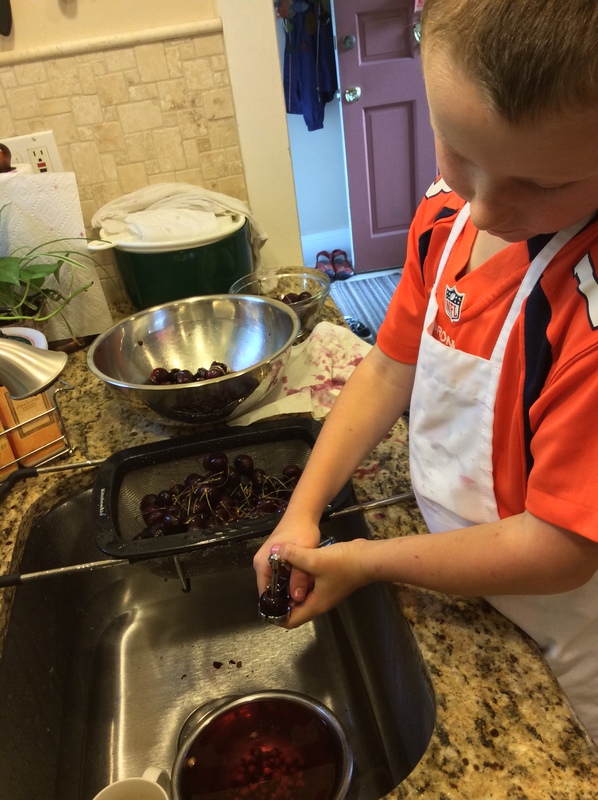 I have a cherry pitter which my son loved helping out with. You could also slice off the end of a cherry and push out the pit with your fingers. 2. 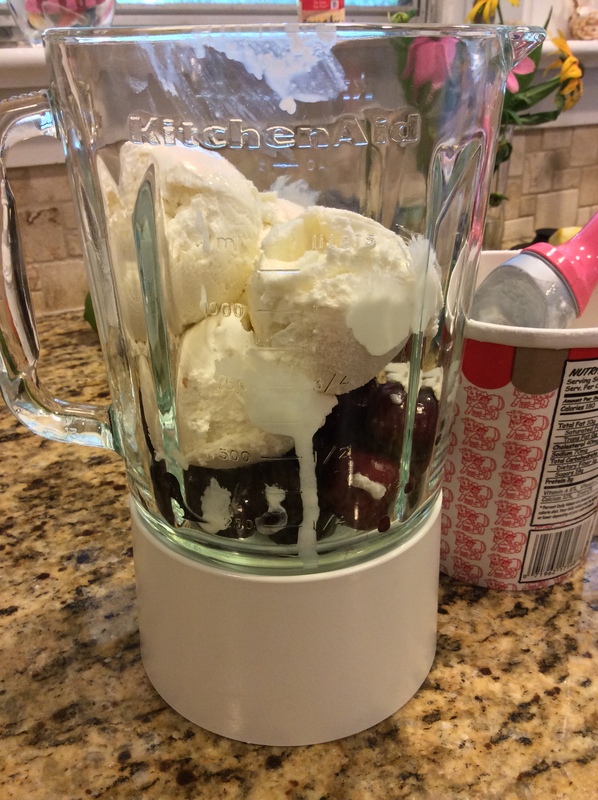 Put cherries and ice cream in the blender and puree. Isn’t that the most beautifully colored milkshake? 3. Pour into glasses, add a straw and enjoy. Summertime blueberries are finally here. 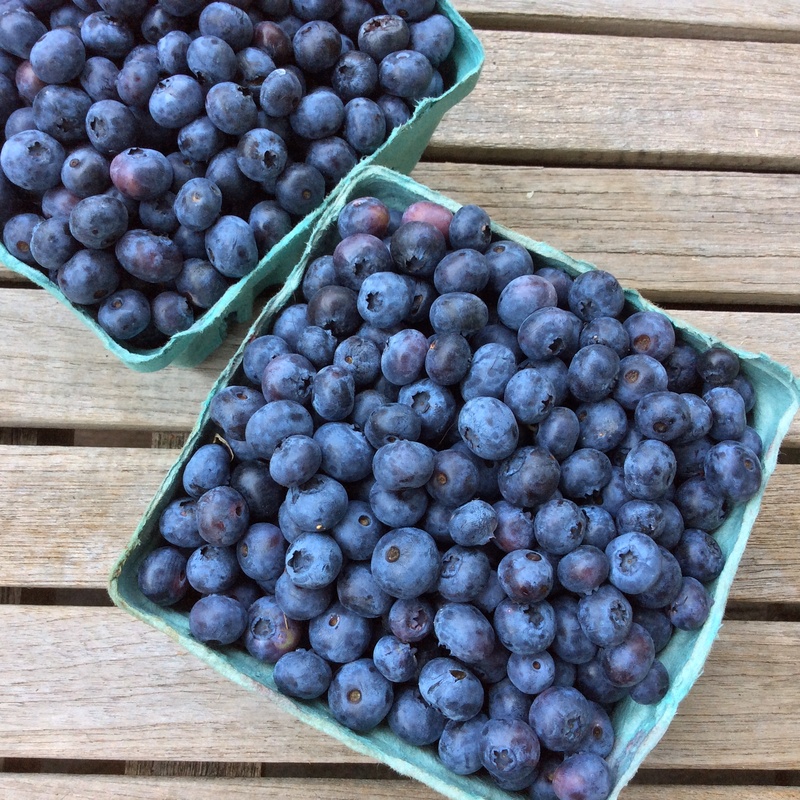 My husband and children went early-season picking (which my husband informs me is much harder work than late season picking) and brought me home an 8-pound haul of blueberries. I have been having delicious fun in the kitchen all week. 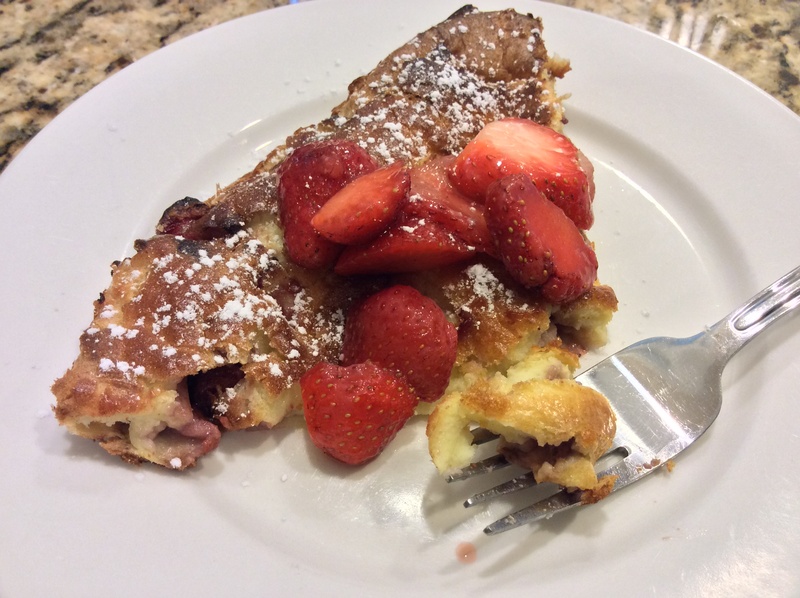 One of my favorite products of the week is definitely the blueberry syrup. It is intensely blueberry flavored, far superior to the store-bought versions, and wonderful poured over pancakes and ice cream. I can imagine it is also delicious over cheesecake or a lemon pound cake, mixed into yogurt, or added to a summer berry parfait. The syrup is simple to make and will last in the refrigerator for up to three months or in the freezer for up to nine. I chose to can my surplus supply so that I could taste summer all winter long. For the first step, I enlisted my children to crush the berries. 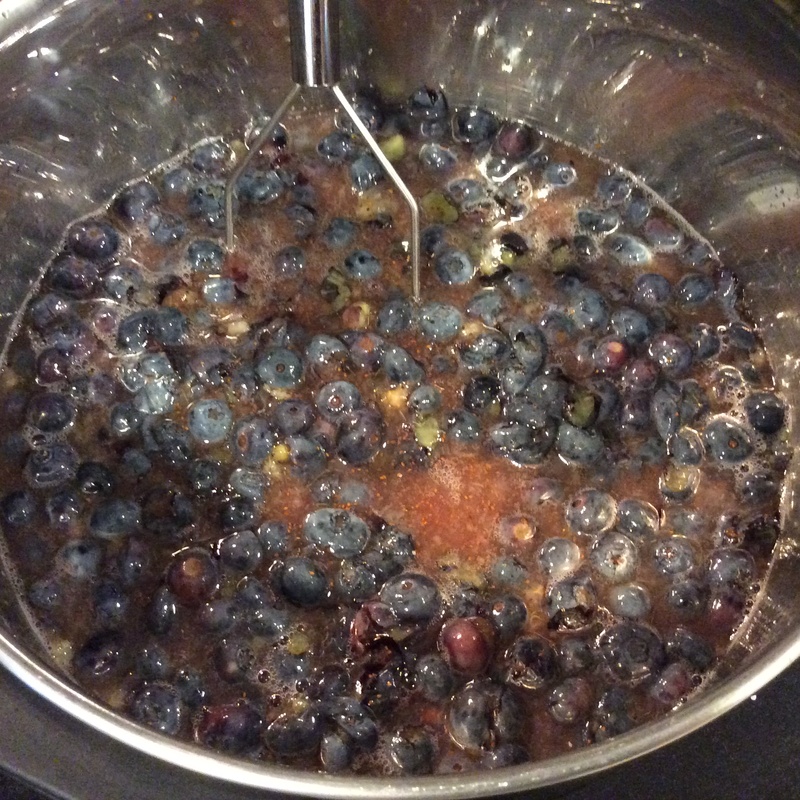 Next, and the part of this recipe that requires the most effort, is straining the blueberry skins. 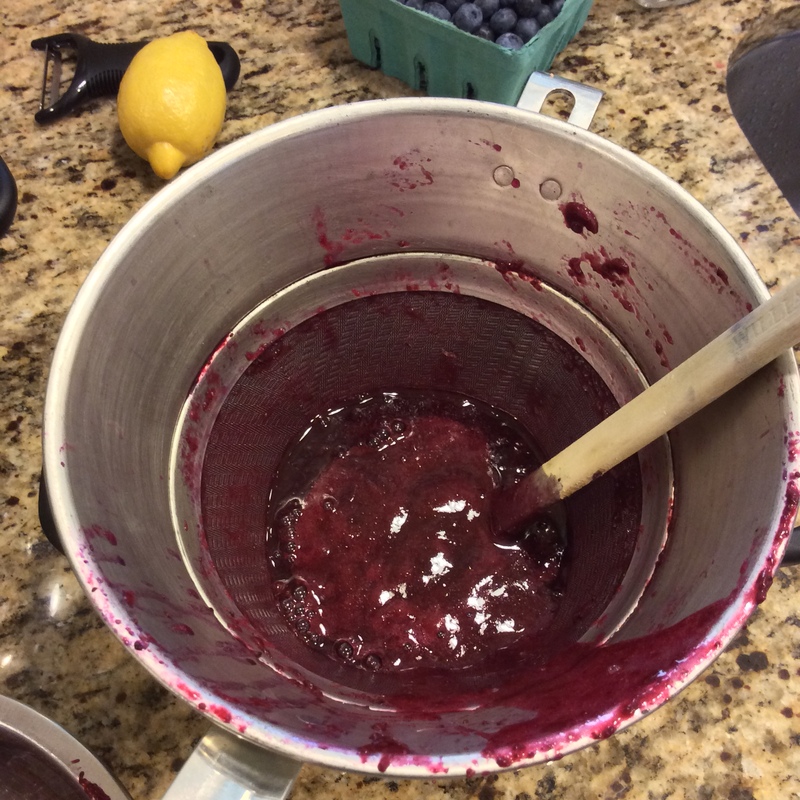 I worked in batches using a rubber spatula to push the blueberry juices through my sieve. 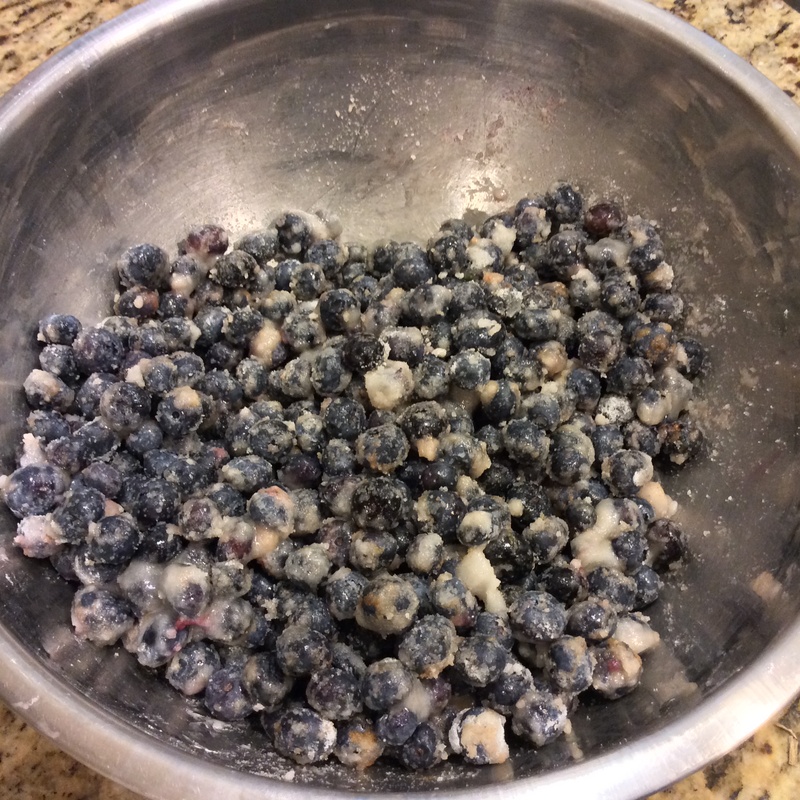 After each batch, I scooped the skins into a separate bowl and saved them to use in a banana-blueberry-yogurt smoothie. After that, the stove top does all the work cooking those juices down into a thick fruit syrup. I hope you give this recipe a try. 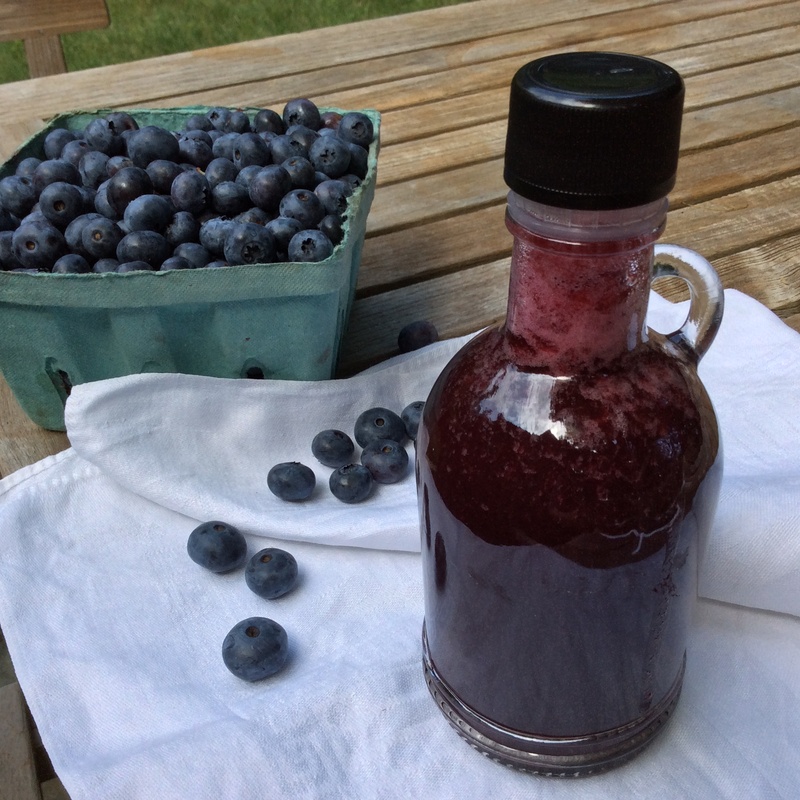 Let me know how it turns out and how you used your summer blueberry syrup. This recipe is adapted from SimpleBites.net. I doubled the recipe and changed the proportions of sugar and lemon flavoring and loved the results. 1. Using a sharp paring knife or vegetable peeler, remove 4 strips of peel from the lemon. Try to remove only the yellow part of the peel, not the bitter white pith. Juice the lemon for about 3 Tbsp. of juice and set aside. 2. 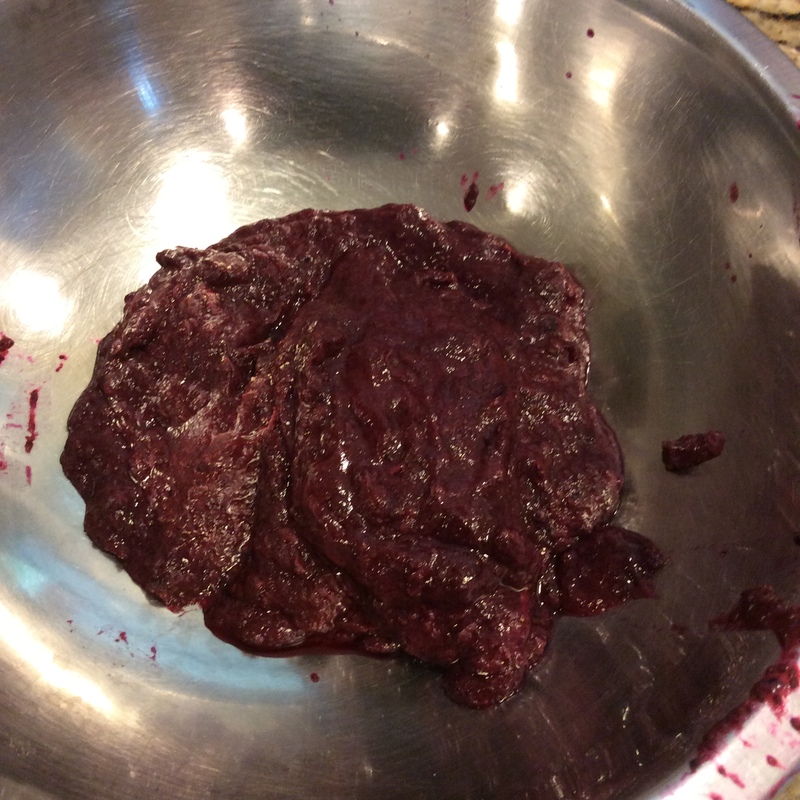 Place berries and water in a large pot and crush the berries (we used a potato masher). Then bring to a boil over medium heat. Lower the temperature to medium-low and simmer for 15 minutes, stirring occasionally. 3. Remove pot from heat. Working in batches, ladle the blueberries into a fine sieve set over a medium-sized pot. 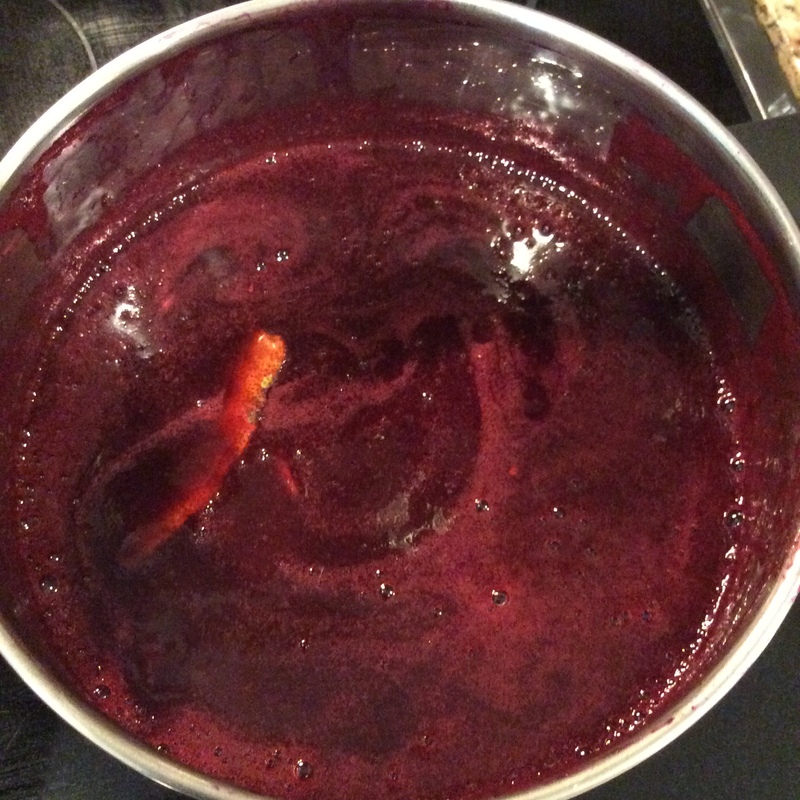 Using a rubber spatula or small ladle, press on the berry mixture to extract as much juice as possible. Scoop out the remaining solids (set aside for a smoothie) and add more berry mixture to the sieve until all of it is strained. 4. Add the reserved lemon peel and the sugar to the pot with the blueberry juices. Bring to a boil and simmer for about 10 minutes or until the mixture thickens slightly. 5. Stir in the reserved 3 Tbsp. of lemon juice. Then boil another couple of minutes. Remove from the heat and carefully remove the lemon zest. 6. Using a funnel, pour the syrup into clean jars. Cover and let cool to room temperature before storing in the refrigerator. If you are canning your syrup, ladle hot syrup into use hot, sterilized jars. Wipe the top of the jars with a clean, damp towel and cover with lids. Place in a hot water canning bath and process for 10 minutes. Remove from water. Let cool to room temperature and store in your pantry. 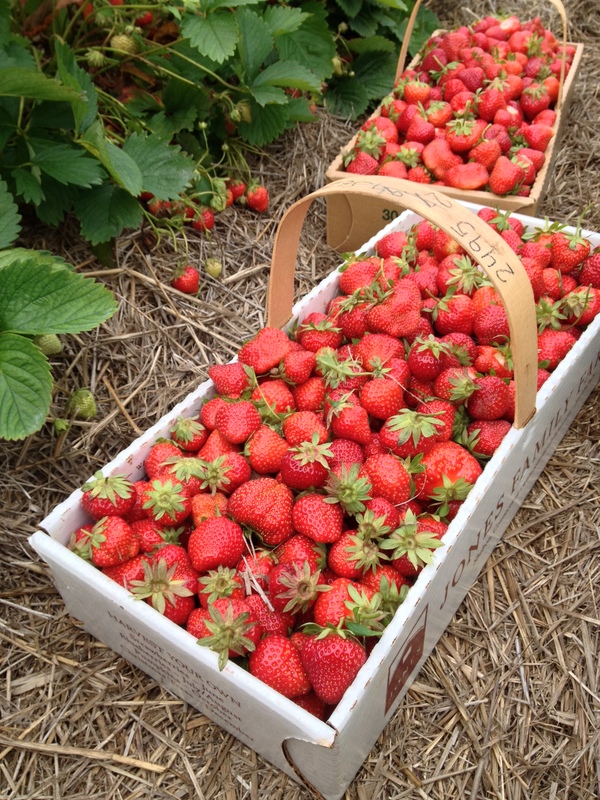 Strawberries, warmed by the sun and picked right from the plant— to me that is the essence of summer. My husband and I have been picking strawberries for years. On our first venture into berry picking, we drove out to the eastern end of Long Island. We drove until we found a hand-painted sign that read: “You Pick Strawberries”. That was before “you” was replaced with a “U.” A gray-haired man with a straw hat sat in a lawn chair watching over his strawberry field. 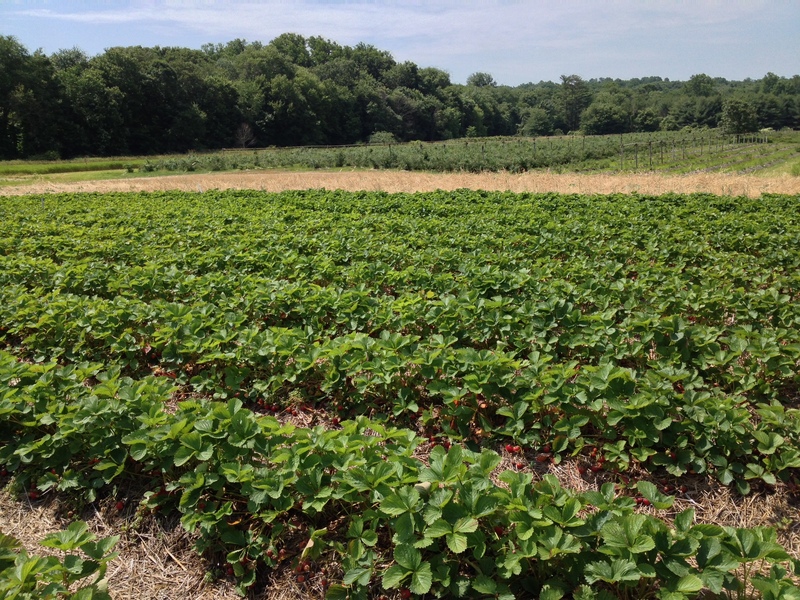 He handed both of us a green cardboard quart container and gave us these instructions: “It ain’t easy.” And he was right— kneeling in the straw-covered rows and searching under leaves for ripe berries isn’t easy work, but as soon as I tasted my first sun-warmed strawberry, I was hooked. We’ve been picking annually ever since. 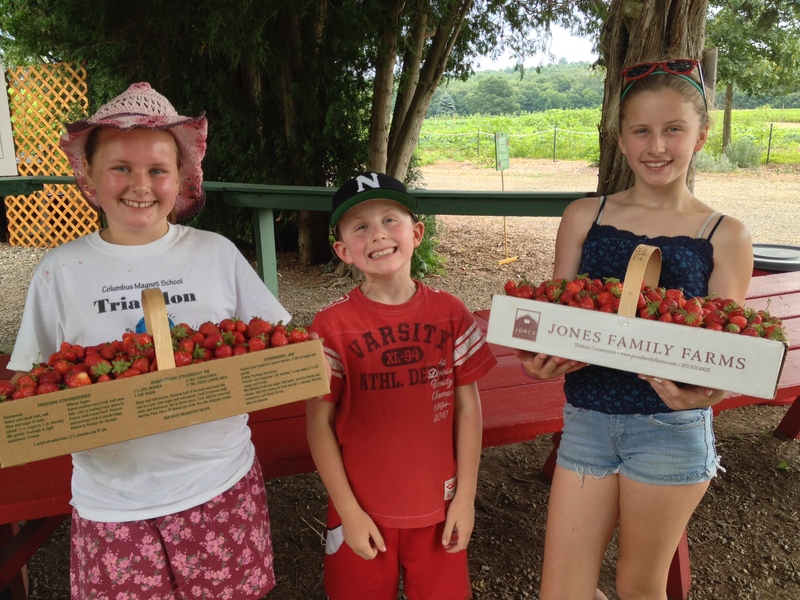 Over the years, we’ve introduced our kids to berry picking. Now that they are capable pickers (they used to be only capable eaters), we haul home a huge amount of berries. Just last week, we brought home over 17 lbs of berries! Maybe we got a little carried away. Still, not wanting to waste a single one, we got right to work using those berries. Our haul was turned into strawberry jam, pie, dutch baby pancakes, strawberry shortcake and many, many were eaten in their whole, sweet perfection. The remaining berries are frozen for future use. Our family’s favorite strawberry dessert has to be shortcake. 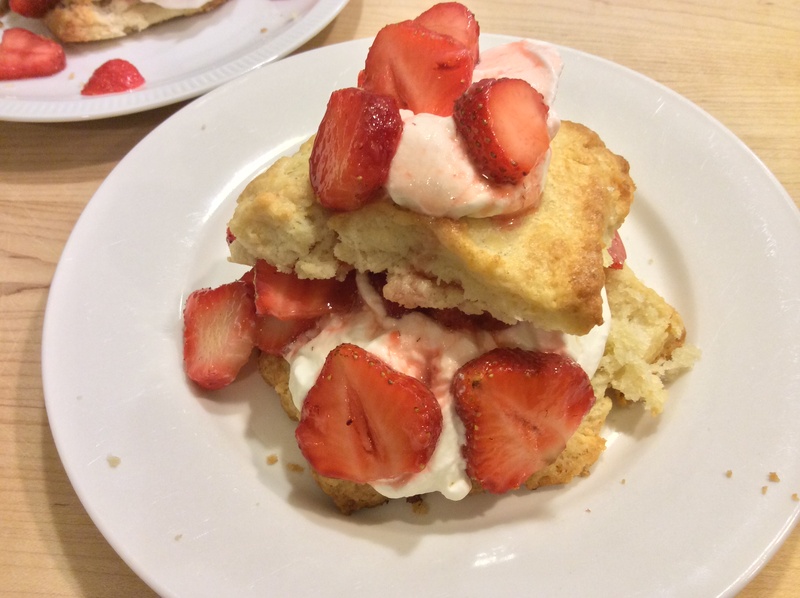 I’ll share my recipe for a tender, sweet shortcake. I first created this recipe for a piece I wrote for Fine Cooking magazine. The key to these shortcakes is to mix just until the dough comes together. Do not overmix. Stop yourself. Press the dough gently together and chill it. These are best eaten the day they are made but can be frozen to enjoy another day. Homemade whipped cream and ripe berries are a must. I realize in most parts of the country it is a little late in the season for strawberry picking but as summer progresses, we add local blueberries, raspberries and blackberries. Shortcakes and whipped cream are delicious with any berries. Happy Summer to you! 1. Line a baking sheet with parchment paper. Combine flour, sugar, baking powder, and salt in a large bowl. Use a fork to toss together. Using a pastry cutter or fork, cut the butter into the flour until the size of large peas. 2. Combine cream and vanilla extract. Make a well in the center of flour mixture and pour in the cream. Mix with a fork until dough is just combined. 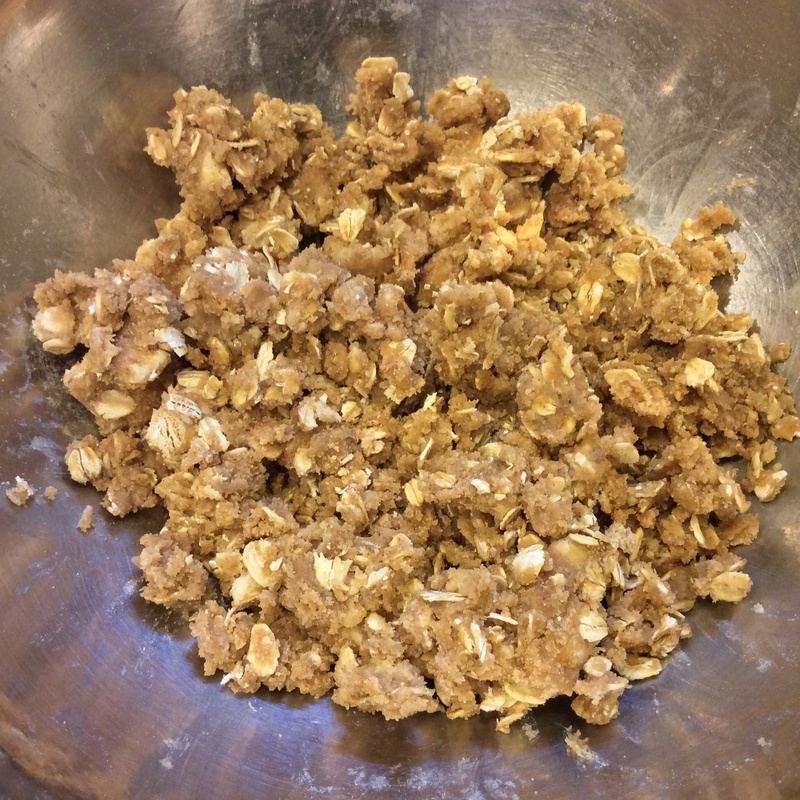 Gently knead a few times in the bowl to pick up any remaining dry ingredients. 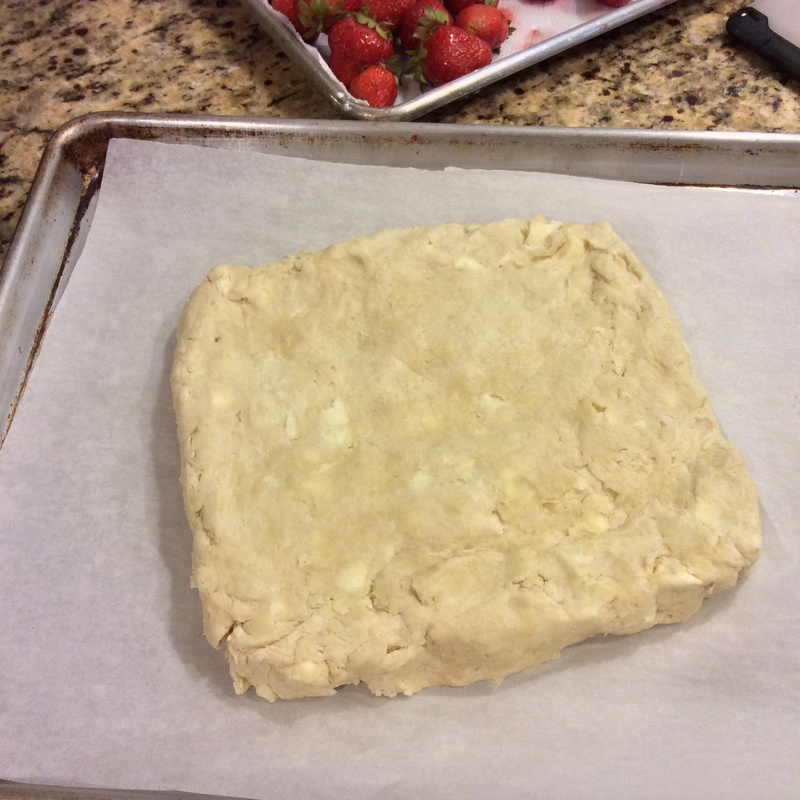 Turn the dough onto a lightly flour surface and pat into an 8-inch square, about 3/4″ thick. Transfer to the baking sheet, wrap in plastic wrap and chill for at least 20 minutes. 3. Heat oven to 425°F. Remove dough from refrigerator. 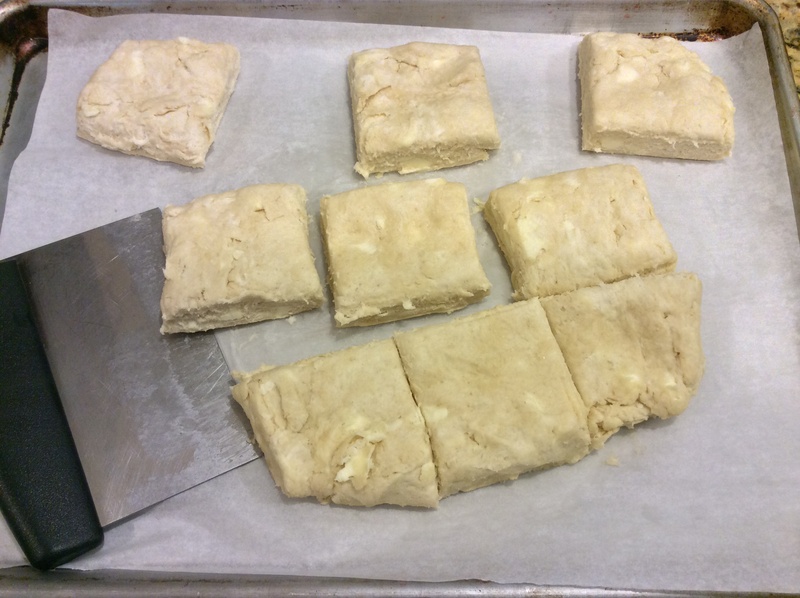 Using a bench knife or large knife, cut dough into 9 even squares and spread them out on baking sheet. Brush each one with heavy cream and sprinkle with sugar. 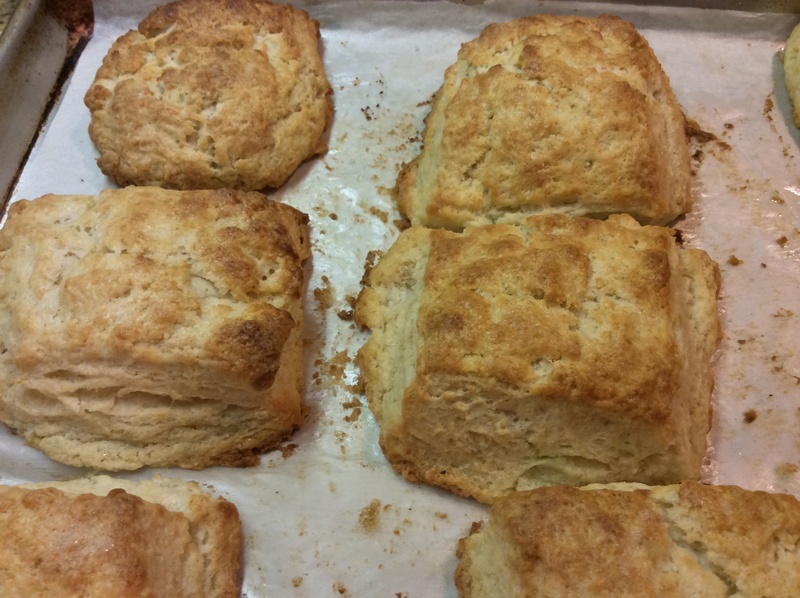 Bake until biscuits are golden brown, about 18 minutes. Let cool until warm. 4. Meanwhile, in medium bowl, toss sliced strawberries with sugar. Taste and add more sugar if still tart. In chilled bowl, whip cream with sugar and vanilla until it is softly whipped and can hold its shape. 5. To serve: slice each biscuit in half horizontally and layer with berries and cream. 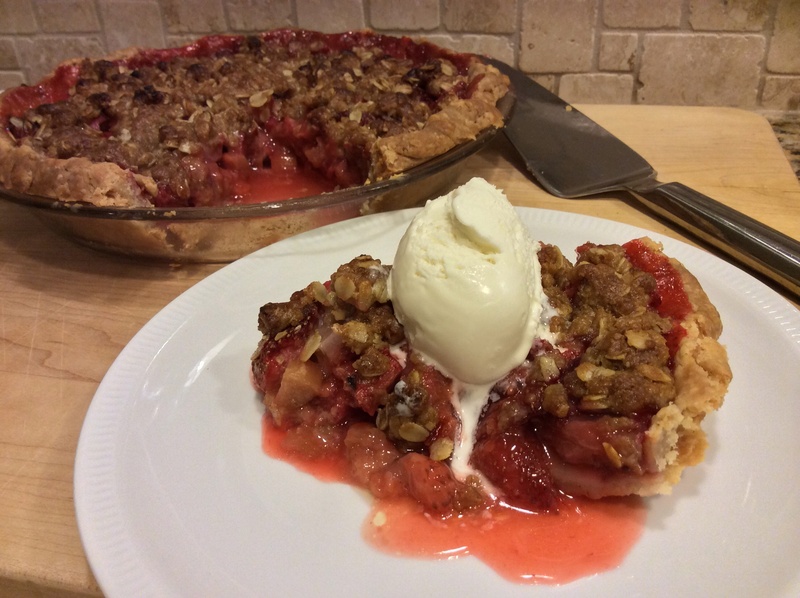 Strawberry-rhubarb pie. What more do I need to say? Make it now! 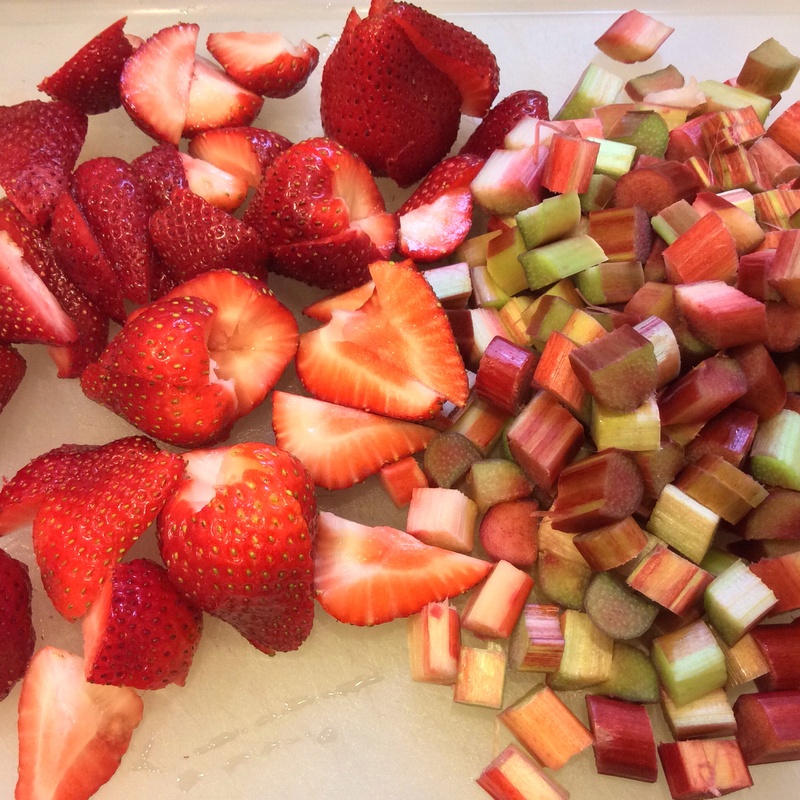 Local rhubarb is in the stores and strawberries are too. 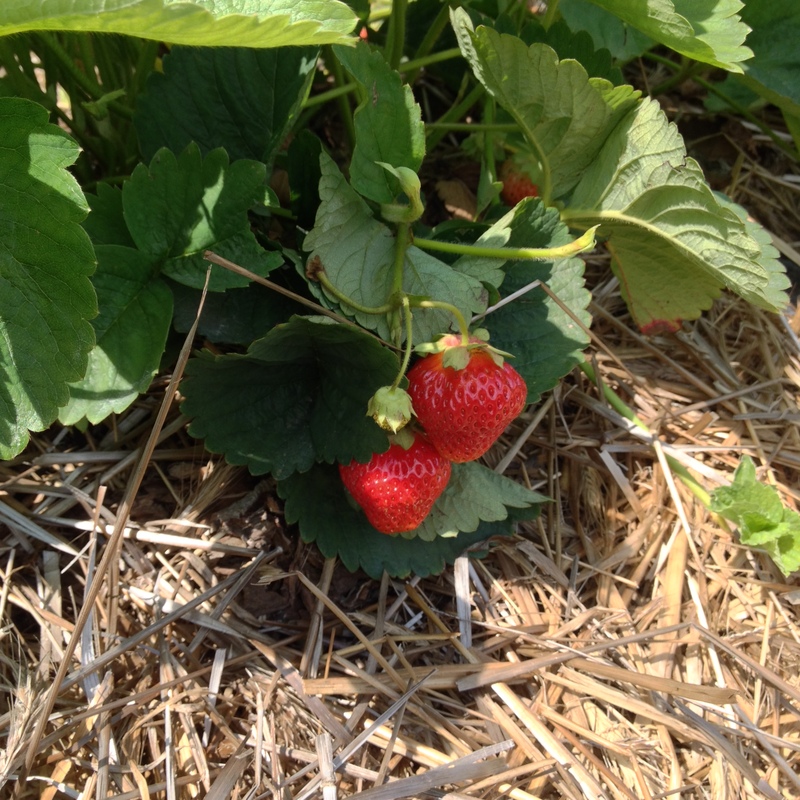 We are coming into mid-season strawberries around here and the berries are deliciously sweet. Rhubarb adds tartness and balances out those sweet berries. But the local strawberry season is fleeting. Get some now and make a pie. Everyone you feed will sing your praises. I had a pie crust waiting in my freezer but I didn’t have a top crust. 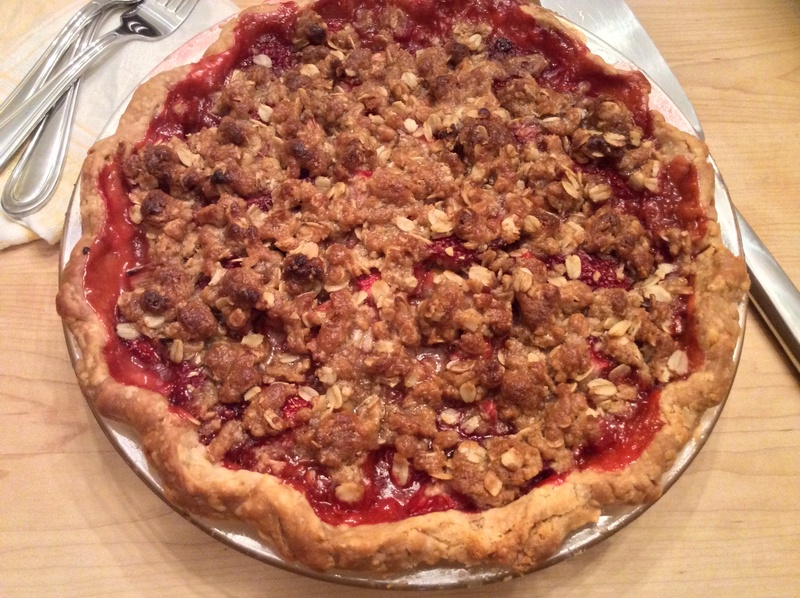 Rather than make pie crust, I decided to make a crumb topping and loved it on this pie. 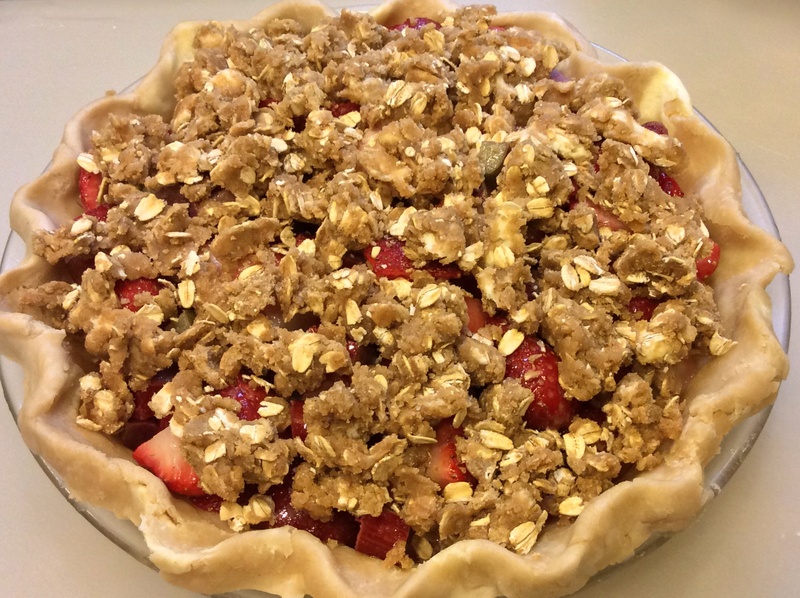 If you don’t have a pie crust waiting to be filled, you’ll find my standard crust recipe below. It is tried and true and works with just about any pie. I never make just one or two crusts though. Doesn’t seem like an efficient use of my time. My recipe makes 5 crusts. Go ahead and make all five. Put those extra crusts in the freezer— ready and waiting for the raspberries, blueberries and blackberries coming into season. Combine fruit with sugar and cornstarch. Mix crumb topping ingredients until well-combined. Pour fruit and juices into pie crust. Spread crumb topping evenly over fruit. Bake and serve warm with a dollop of vanilla ice cream. 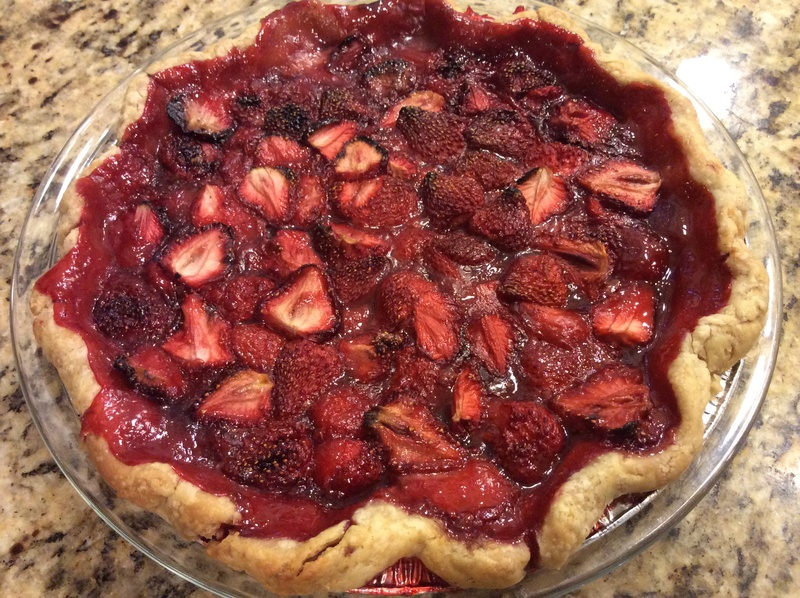 I made this pie early in the strawberry season. 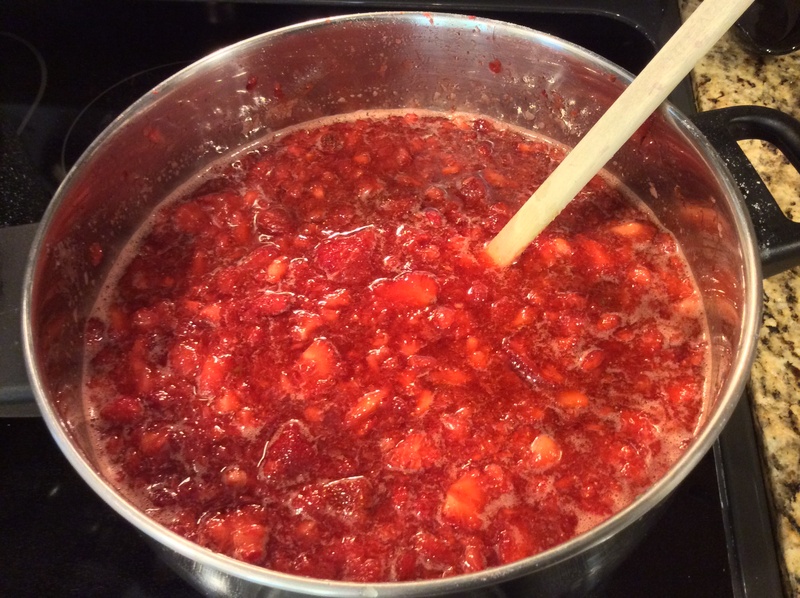 If you are using very sweet late season berries, I suggest cutting the sugar to 1/4 cup. 1. Preheat oven to 400°F. 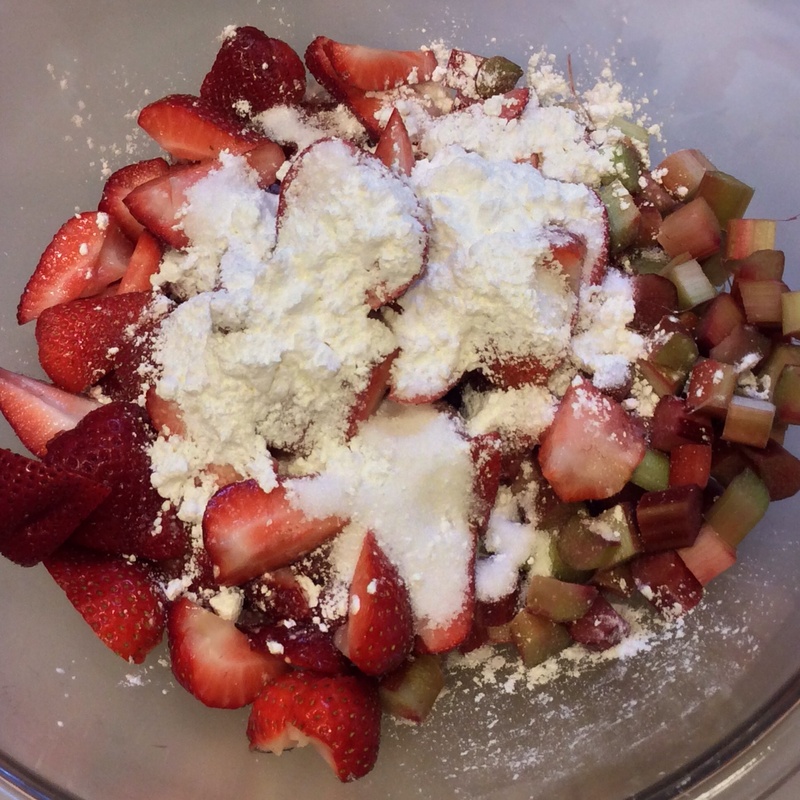 In large bowl, toss together rhubarb, berries, sugar and cornstarch. Set aside. 2. In another bowl, combine crumb topping ingredients. Mix until well combined. 3. 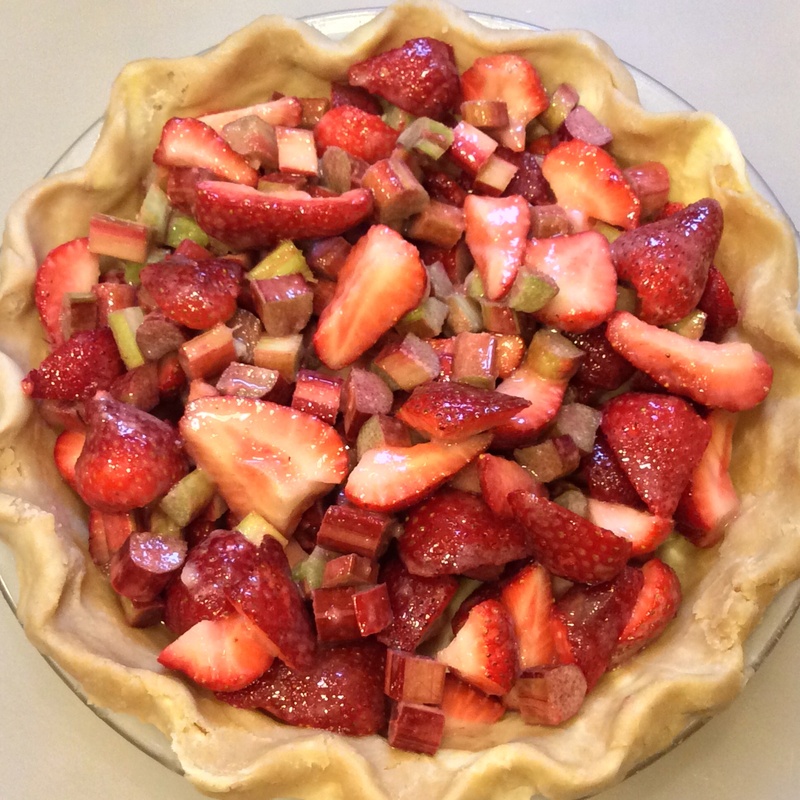 Pour rhubarb and berries into pie crust. Cover top with crumb topping. Place on a sheetpan in case juices run out of pie pan. 4. Bake at 400°F for 20 minutes, then reduce temperature to 350°F and continue baking until crumb topping is browned and juices are thick and bubbly, about 40 more minutes. This is a recipe where a scale is worth its weight in gold. 1. Slice butter into large chunks and place in freezer. Put measured shortening into freezer. 2. 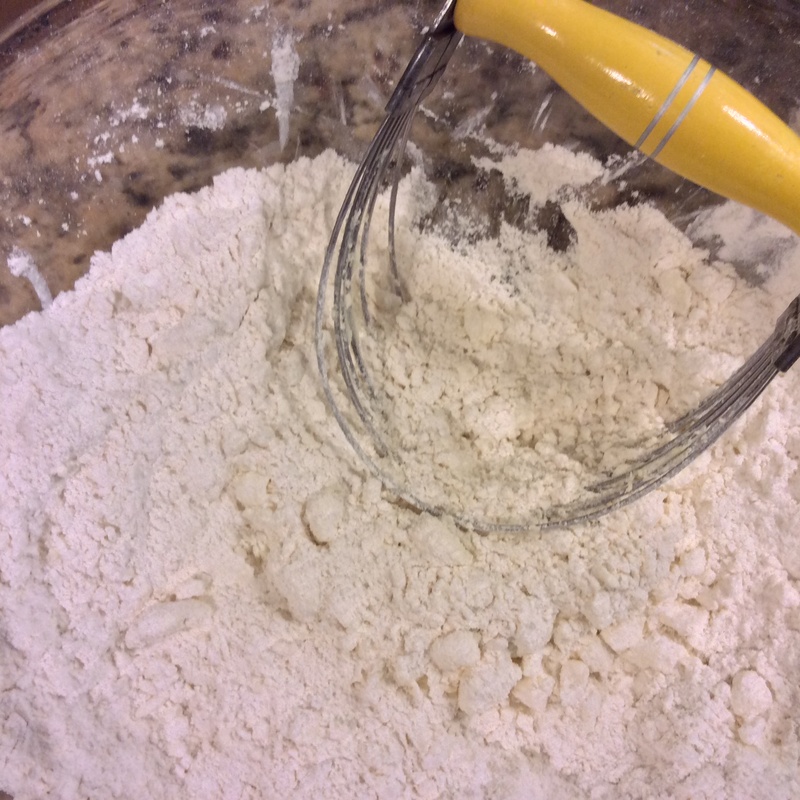 Measure flour and salt into the bowl of electric mixer, or a large mixing bowl. Stir to combine. Add butter and mix with a paddle or pastry cutter until butter pieces are the size of large peas. 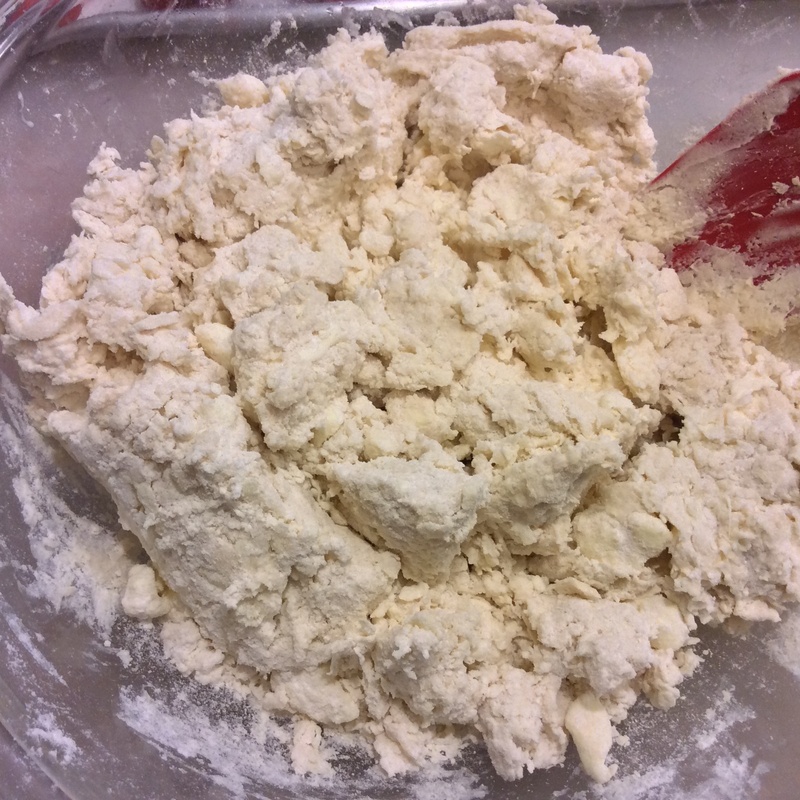 Add cold shortening and mix until combined with flour. 3. 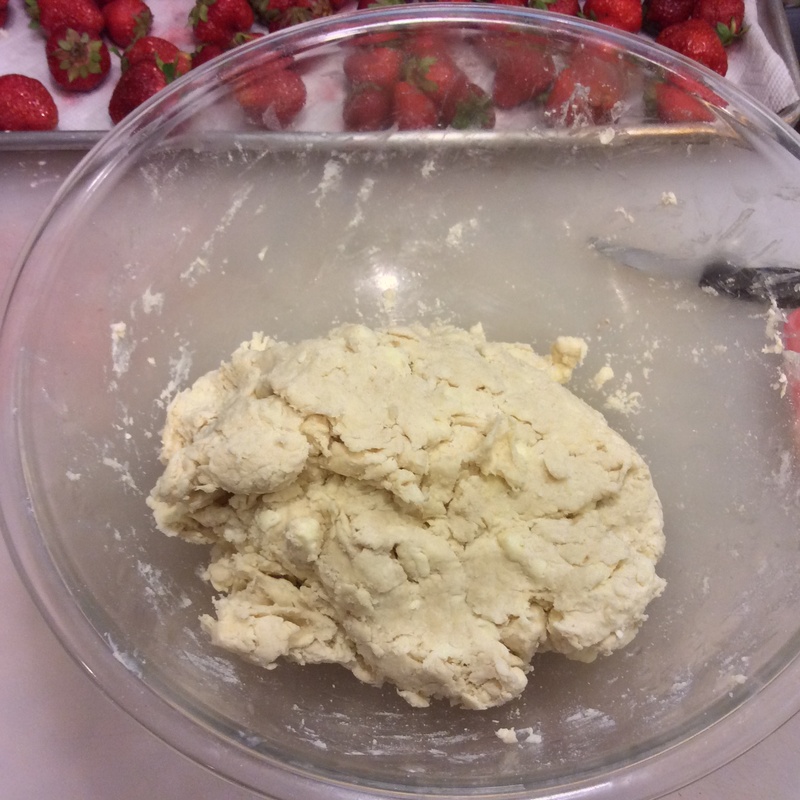 While mixer is running, pour in about 3/4 cup of ice water and mix until dough is just combined. 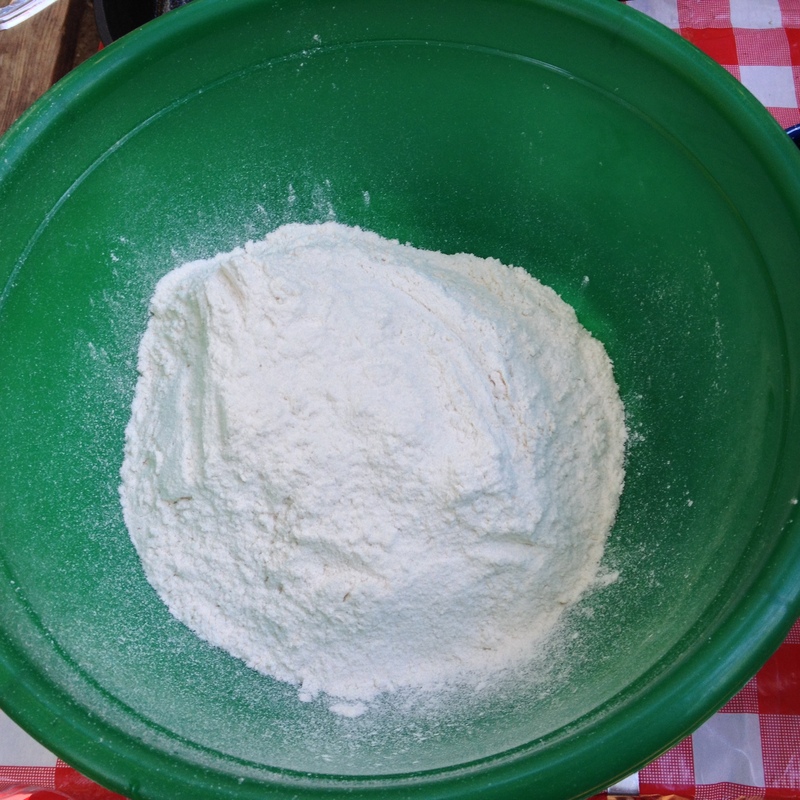 If there is a lot of flour left in bowl, add more water and mix briefly to combine. Pour dough out onto a large piece of plastic wrap and, using hands, mold it into a large mound. Wrap well and chill at least 1 hour. 3. Divide dough into 5 even crusts (10 oz. each). Roll dough, place in pie plate and chill again for at least 30 minutes before using. I’ve been sitting on a recipe I have want to share since Mother’s Day. When that day dawned sunny and clear and the mercury hit 80 (first time all spring!) 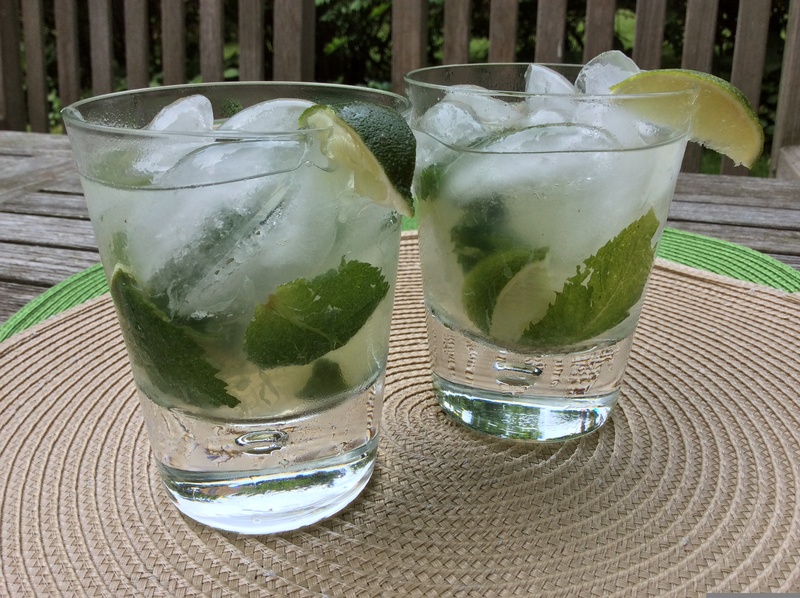 I decided it was time to celebrate with my favorite summer cocktail— a Mojito. I mixed two up for my husband, Lou, and me. Then I proceeded to knock one off the counter (aargh). After picking up shattered glass, vacuuming and mopping, I finally and thoroughly enjoyed my cocktail. Lou got a beer (after all it was Mother’s Day). Muddle mint & lime with simple syrup. Add ice, rum, seltzer. Stir. Use this recipe more as a guideline. My brother-in-law, Chuck, shared this method of making Mojitos with me by pouring a little of this and that in a glass. I usually mix my Mojitos that way too, but for you I measured the ingredients. It is customizable and certainly can be sized up to make a pitcher full. I like my Mojito a little on the sweeter side while Lou likes his stronger. Leave a little room at the top of your glass, taste and adjust to your liking. The only special tool you need is a muddler to really work the flavor out of the mint and lime. I have made-do in the past with the end of a wooden spoon. I wouldn’t try a heavy-duty pestle as that has broken a glass or two of mine. I made mint simple syrup for this recipe but plain works too. I mix 1 cup sugar with 1 cup water in a pot and bring to a boil, stirring occasionally. Add mint leaves if you like and cook until the sugar is dissolved. Let cool before using. Now go find a reason to celebrate and let me know how you like your Mojito! 1. Split mint leaves between glasses. Pour a little more than 1/2 the syrup between the 2 glasses. Use muddler to crush mint. Add lime wedges and muddle again to extract lime juice. 2. Add ice to fill the glasses. Split rum and seltzer between the 2 glasses. Stir and then taste and adjust to your liking with more sugar or rum. Garnish with another lime wedge and enjoy.